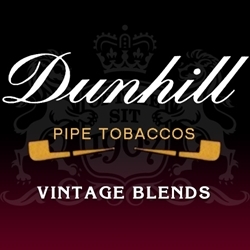 Since 1905, Dunhill Pipe Tobacco has established itself as one of the most distinguish premium pipe tobacco brands on the market today. Dunhill is famous for creating high-quality English style pipe tobacco mixtures that deliver rich and zesty flavors with unrivaled bouquets and sweet aromatic room notes. Smoking connoisseurs have enjoyed this perfect combination of ribbon-cut premium pipe tobacco for decades. Easy to pack in your favorite pipe, each bowl burns smooth and mellow, long and consistent. Smokers Discounts believes you'll have a relaxing and satisfying smoking experience with the varieties of flavored choices listed below at our online pipe tobacco store. Each of these styles are in stock today at a low discount price! Call us for more details!